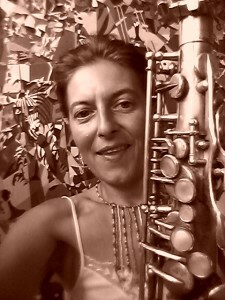 Italian saxophonist and composer Nicoletta Manzini has performed throughout Europe with her own group and as a member of the Steve Grossman Quintet. She recently moved to New York, where she made her last recording with her trio, including bassist Tyler Mitchell and drummer Shinnosuke Takahashi. For her show at the Inkwell Jazz Cafe, 408 Rogers Avenue between Sterling St and Lefferts Ave., on April 8, Nicoletta will be joined by Tyler Mitchell on bass and Bernard Linnette on drums, playing a selection of standards and original compositions. The trio will play two sets, from 7:30-9:30. Food and drink available. $5 suggested donation supports the musicians and PLG Arts.